WAV (Waveform Audio File Format) is a Microsoft and IBM audio file format standard for storing an audio bitstream on PCs. It is an application of the Resource Interchange File Format (RIFF) bitstream format method for storing data in "chunks", and thus is also close to the 8SVX and the AIFF format used on Amiga and Macintosh computers, respectively. It is the main format used on Windows systems for raw and typically uncompressed audio. The usual bitstream encoding is the linear pulse-code modulation (LPCM) format. WAV is the main format used on Windows systems for storing uncompressed, lossless audio. WAV is a variant of the RIFF bitstream format method for storing data in "chunks". It is thus similar to both the IFF and AIFF formats used on Amiga and Apple Macintosh computers respectively. WAVs and AIFFs are in general equally compatible with either Windows or Macintosh operating systems. WAV files always have little-endian byte order whereas the original AIFF format was big-endian until Apple modified it for use on their OS X operating system. While the RIFF format can act as a container for various audio compression codecs, more typically it contains uncompressed pulse-code modulation (PCM ) audio that retains all the samples of the original signal, and is thus known as "lossless". PCM is the format standard of audio CDs, conveying two channels with a sample rate of 44,100 Hz (samples per second), and a bit depth of 16 bits per sample. I recommend you a great freeware to burn WAV to CD. It's foobar2000. 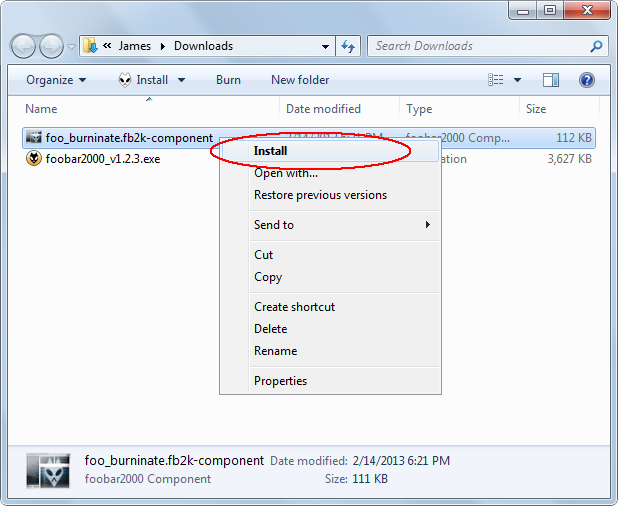 foobar2000 is a trustworthy application due to its rich feature design, as well as that it uses considerably little system resources to provide flawless quality audio. It is a common media player used today and manages to stay amongst the best of its kind. 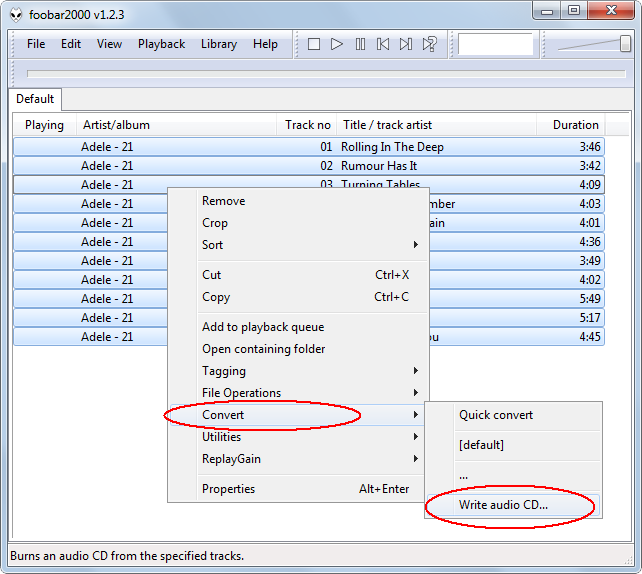 To burn WAV to CD, please add the WAV files you want to burn to foobar2000 freeware, and then select the WAV files and then right-click on the items and choose "Convert" -> "Write audio CD." And then, insert an empty CD-R or CD-RW disc to CD burner or CD Writer drive, and then click OK to burn WAV to CD. You can also burn WAV to CD with Windows Media Player. 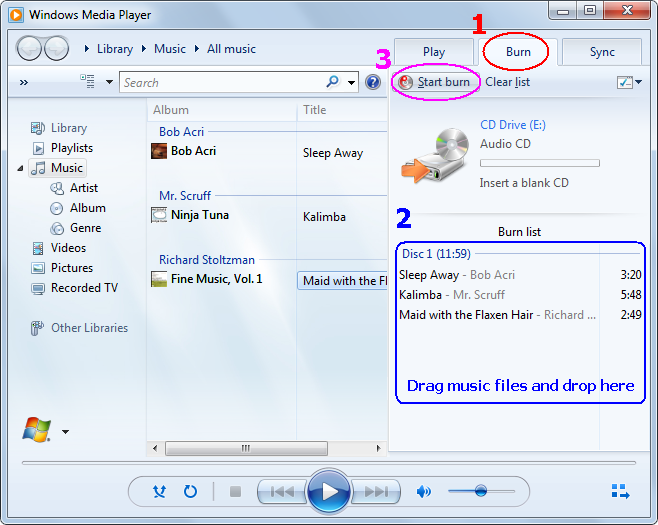 For more information, refer to article Burn MP3 to CD with Free MP3 to CD Burner Freeware on Windows 7/8.